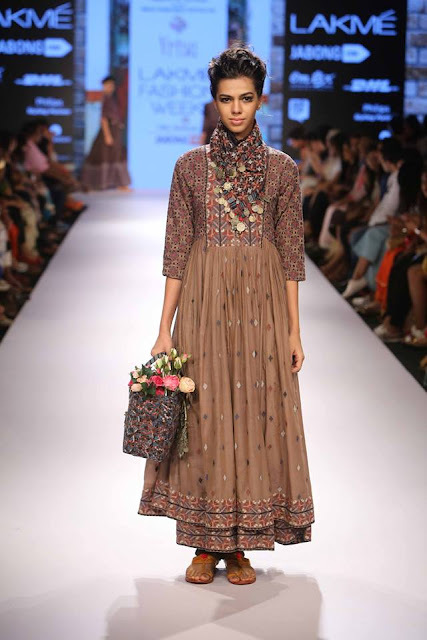 RAHUL N SHIKHA FROM ‘VRISA’ REVIVED THE OLD WORLD CHARM OF TRADITIONAL TEXTILES AT LAKMÉ FASHION WEEK WINTER/FESTIVE 2015. 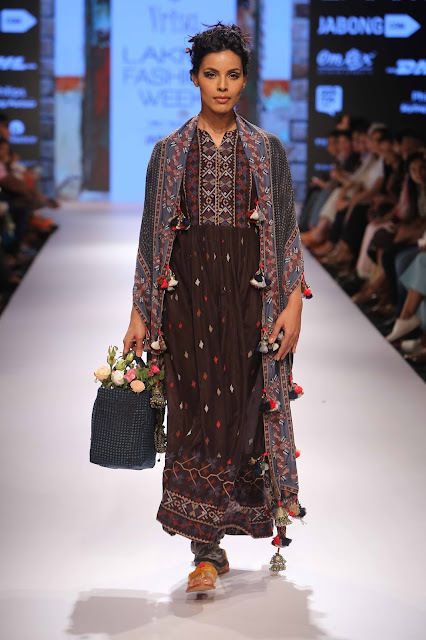 Jaipur based designers Rahul n Shikha with their brand ‘Vrisa’ did what they do best and rejuvenated one of the oldest forms of textile designing for their collection “A-Jharat” (derived from Azrak meaning blue in Arabic) at Lakmé Fashion Week Winter/Festive 2015. The clothing line ‘A-jharat’ was based on the Sanskrit word of the same, which was where the fabric was believed to have gotten its name. 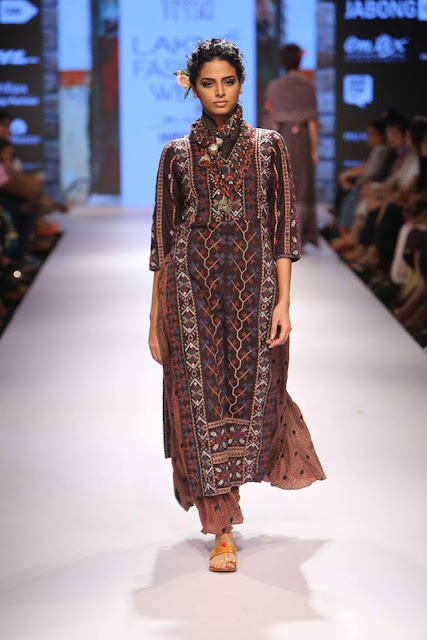 The range of clothing was immensely influenced by Ajrak designs and the printing technique used to make unique textiles called Bagru-Dabu. This kind of printing also involves the use of all natural dyes extracted from plants, flowers, trees and fruits therefore making it eco-friendly and pure. The intricate facet in the prints was also created by the terrific duo and gave an added edge to the collection. The chroma of the collection had steel blues and tinges of red, white and navy blue peeking through the embroidery. 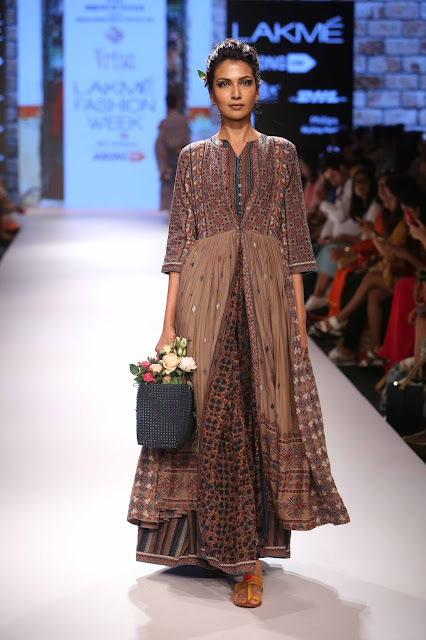 The silhouettes stayed true to tradition with long anarkalis and kurtas with pleat variations along with colourful tassels and silver detailing. 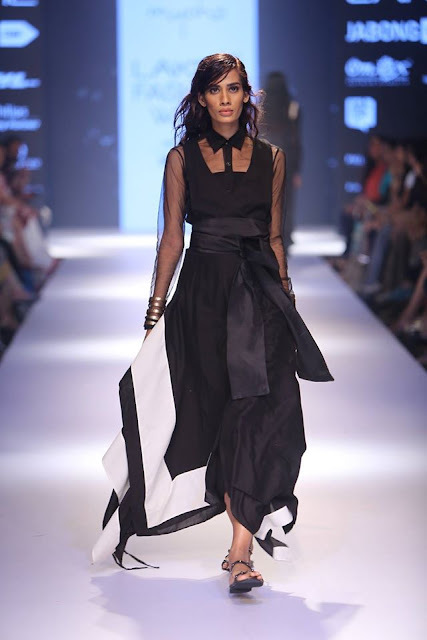 Eye-catching ensembles were the jet black anarkali with printed cigarette pants and the sleeveless button-down blouse worn over a skirt, which had a gracefully draped dupatta on one shoulder. 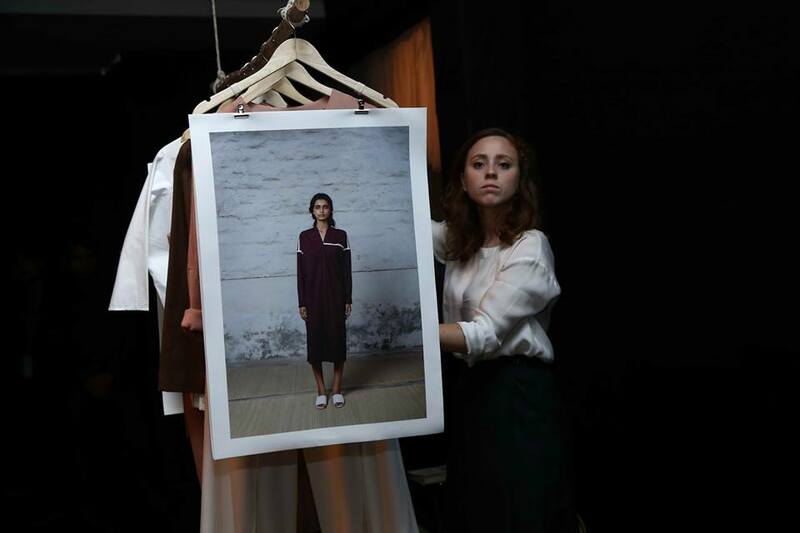 Staying true to their brand ‘Vrisa’, Rahul n Shikha conceptualised “A-Jharat” and the need for “green” clothing that also incorporated art that the nation is famous for, making the wearer a proud fashionista. 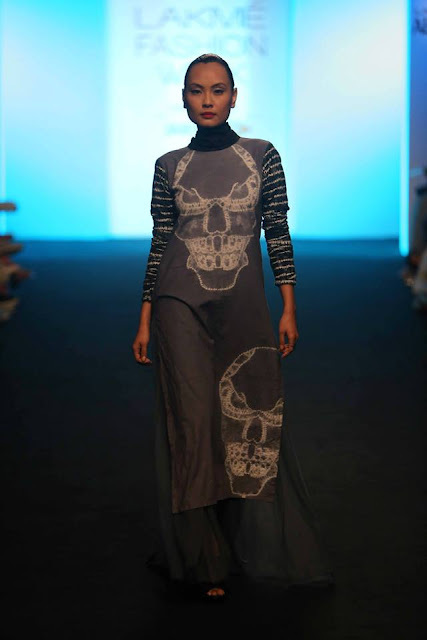 Mumbai, 27 August, 2015: Priyanka Dagdee’s ‘Hastkala’ label presented “The Mysterious Beginnings”, at Jabong Stage during Lakmé Fashion Week Winter/Festive 2015. Her childhood memories of ghosts and spirits stories were dark, mysterious and enchanting. The designer recreated timeless beauty with strong contours and cuts to give a classic appeal to the silhouettes. The models strutted down the ramp in Monochrome hues splashed with cranberry. 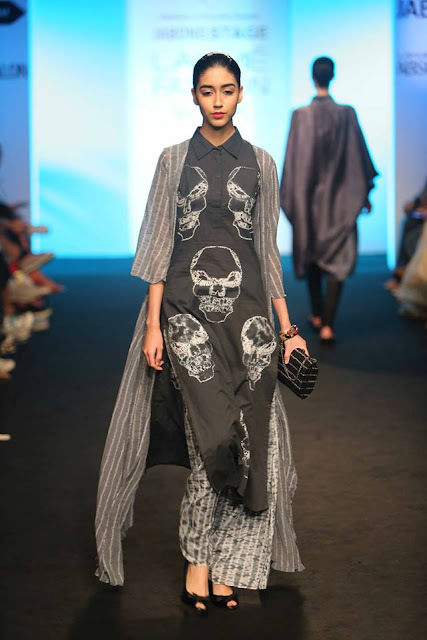 The motifs of skulls and bones breathed life on the easy going loose silhouettes. Giving a classic appeal to her collection were collared loose tops, palazzo pants, long gathered skirts, and capes. A standout garment from her line was a charcoal sari embellished with ivory motifs. The designer reinvented classic silhouettes with a monochrome coloured striped Sharara pant paired with a cropped top and cape. Creatively playing, the designer showcased a cranberry blazer and pencil skirt paired with charcoal leggings. Keeping minimal embellishments, Priyanka enthralled the audience with a versatile range of understated elegance. Rejuvenating Indian aesthetics, Priyanka used Tie and Dye techniques throughout her collection. The glitzy line of garments was made of indigenous fabrics like pure silk and cotton. Handmade techniques and textures gave a perfectly urbanised look to the serene silhouettes. 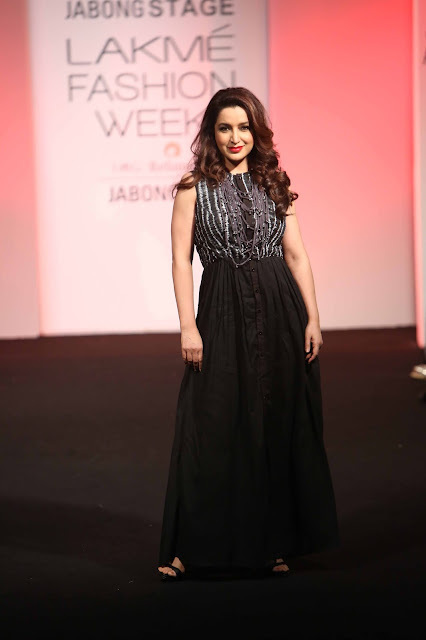 Making a dramatic entry was Bollywood and TV star Tisca Chopra in a mesmerising black gathered gown with an enticing chained neckpiece. “The Mysterious Beginnings” by Priyanka Dagdee’s ‘Hastkala’ label mesmerised the audience with her magical collection and will create a stir on the fashion circuit. 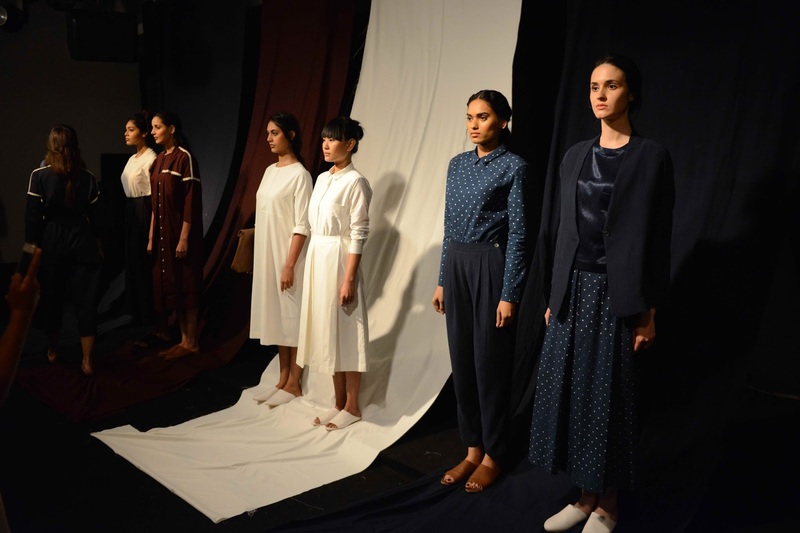 The “Maisa” collection dreamt up by Kiran and Meghna for their label ‘Myoho’ at Lakmé Fashion Week Winter/Festive 2015 was a layered fashionable tribute to women of strength. Selecting a fabric story that moved effortlessly from tussar to gajji silk in monochromes, the garments were a sharply cut line. Splashes of deep red appeared at times for the “Maisa” ensembles, which means “one with the proud walk” and that is exactly how the models looked as they strutted down the ramp with great élan. The collection was an unconventional blend of fluid yet wild elements, which were balanced perfectly for the creations, which were cleverly crafted into a variety of silhouettes and shapes. 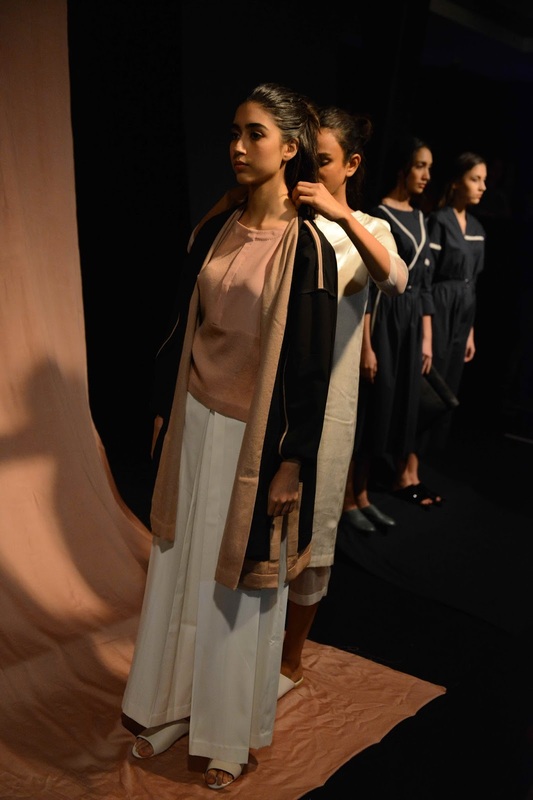 Opening with a Marsala draped pant and blouse, the fabric treatment was eye-catching. The reversible maroon and black cover, asymmetric tunic and skirt, belted coat over sheer embroidered cover and black/ white polka dotted ruffled kurta made impressive entries. 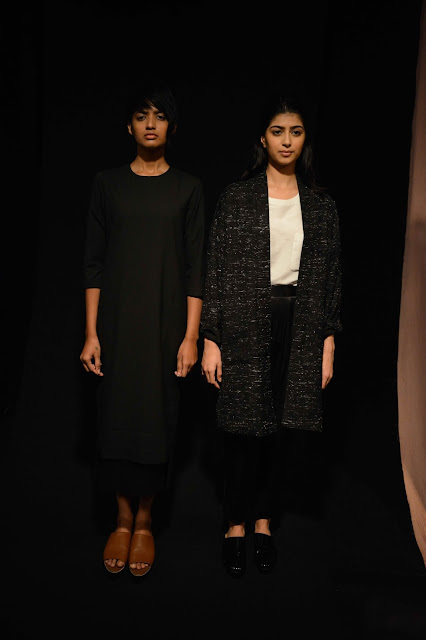 A long sleeved midi, asymmetric side flap black dress, indigo tunic with embroidery detailing and the black/white jumpsuit presented a modern look at some basic silhouettes. The two saris were displayed, belted with long sleeve sheer kurta or a tunic and the final churidars under a tulle skirt with a long sleeve choli offered an adventurous look at women’s wear. For a woman who wants to make a strong fashion statement, the “Maisa” collection by Kiran and Meghna for their label ‘Myoho’ had all the perfect elements. Mumbai, 27 August, 2015: Ruchika Sachdeva, the vivacious young designer who created the brand BODICE, turned it into a success at a very young age. Often, known for her free spirited vision and individuality, she again presented a splendid range of apparels at Jabong Stage during Lakmé Fashion Week Winter/Festive 2015. 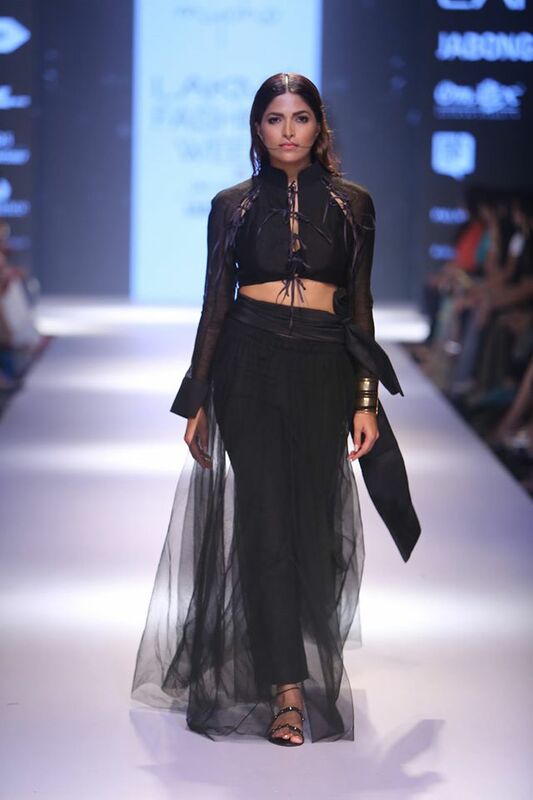 Ruchika Sachdeva showcased a new fashion horizon for Indian women who are untamed yet rooted strongly to their soil. Holding to the spark of effortless elegance with a contemporary mélange, Ruchika managed to portray through an innovative installation that the New Age girl can convey it all. Silhouettes were laid back and spoke of serenity with a twist of flamboyance and easy chic. The compatibility of colour with nature was envious - the sub shrub indigo and the sunray marigold were a lethal scheme. Deep tan and metallic rust were equally complementing the organic enchantment. Experimental textures were attempted and the results were found in the form of innovative and distinctive patterns. The incorporation of batik and resist polka dot fabric for layered constructed silhouettes gave the line an exuberant and radiant appeal. The garments ranged from calf length dresses in solid shades with jackets thrown over and structured formal tops paired with ankle length trousers. This presentation was more of an experiment done to showcase a different depiction of the runway; it was a high end installation of international standard. The ambience was intense with fabrics playing the perfect backdrop and the models being a part of the installation, was a bold risk well paid off. 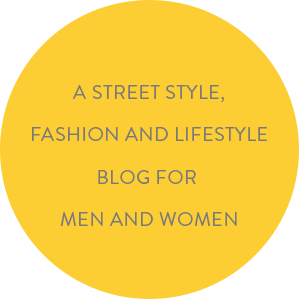 Ruchika Sachdeva exhibited the perfect wardrobe choice for the constant jet setters, who are always on the go and would still want their style game to be on point.